Tape as part of the backup process has been blamed for everything that can go wrong during the backup process and has lead to the pronouncement that “tape is dead”. Recent technology enhancements though have made it clear that there is no more cost effective, reliable and portable media than tape. 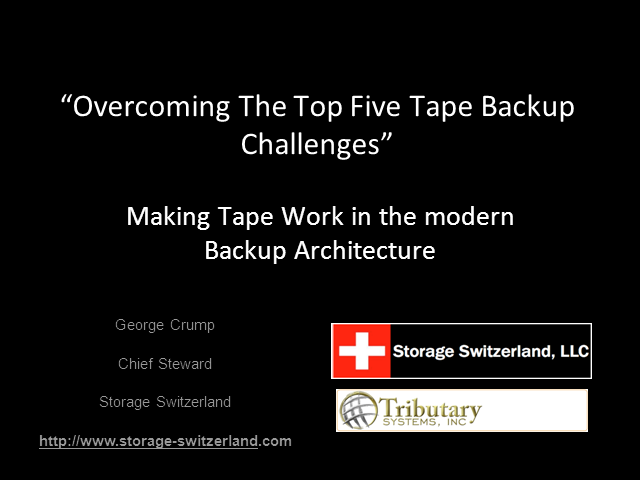 Tape does have its challenges and in this webcast featuring Storage Switzerland’s Lead Analyst, George Crump and Tributary’s Director of Product Management Glenn Grunstrom the top five tape backup challenges will be discussed and ideas on how to overcome them given.